"Man is a tree of the field," and the Jewish calendar reserves one day each year -- the New Year for Trees on the 15th of Shevat -- for us to contemplate our affinity with our botanical analogue and what it can teach us about our own lives. The tree's primary components are: the roots, which anchor it to the ground and supply it with water and other nutrients; the trunk, branches and leaves which comprise its body; and the fruit, which contains the seeds by which the tree reproduces itself. The spiritual life of man also includes roots, a body, and fruit. The roots represent faith, our source of nurture and perseverance. The trunk, branches and leaves are the body of our spiritual lives -- our intellectual, emotional and practical achievements. 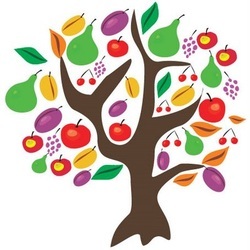 The fruit is our power of spiritual procreation -- the power to influence others, to plant a seed in a fellow human being and see it sprout, grow and bear fruit. The roots are the least glamorous of the tree's parts--and the most crucial. Buried underground, virtually invisible, they possess neither the majesty of the tree's body, the colorfulness of its leaves nor the tastiness of its fruit. But without roots, a tree cannot survive. Furthermore, the roots must keep pace with the body: if the trunk and leaves of a tree grow and spread without a proportional increase in its roots, the tree will collapse under its own weight. On the other hand, a profusion of roots makes for a healthier, stronger tree, even if it has a meager trunk and few branches, leaves and fruit. And if the roots are sound, the tree will rejuvenate itself if its body is damaged or its branches cut off. Faith is the least glamorous of our spiritual faculties. Characterized by a simple conviction and commitment to one's Source, it lacks the sophistication of the intellect, the vivid color of the emotions, or the sense of satisfaction that comes from deed. And faith is buried underground, its true extent concealed from others and even from ourselves. Yet our faith, our supra-rational commitment to G-d, is the foundation of our entire tree. From it stems the trunk of our understanding, from which branch out our feelings, motivations and deeds. And while the body of the tree also provides some of its spiritual nurture, the bulk of our spiritual sustenance derives from its roots, from our faith in and commitment to our Creator. A soul might grow a majestic trunk, numerous and wide-spreading branches, beautiful leaves and lush fruit. But these must be equaled, indeed surpassed, by its roots. Above the surface, there might be much wisdom, profundity of feeling, abundant experience, copious achievement and many disciples; but if these are not grounded and vitalized by an even greater faith and commitment, it is a tree without foundation, a tree doomed to collapse under its own weight. On the other hand, a life might be blessed with only sparse knowledge, meager feeling and experience, scant achievement and little fruit. But if its roots are extensive and deep, it is a healthy tree: a tree fully in possession of what it does have; a tree with the capacity to recover from the setbacks of life; a tree with the potential to eventually grow and develop into a loftier, more beautiful and fruitful tree. The tree desires to reproduce, to spread its seeds far and wide so that they take root in diverse and distant places. But the tree's reach is limited to the extent of its own branches. It must therefore seek out other, more mobile couriers to transport its seeds. So the tree produces fruit, in which its seeds are enveloped by tasty, colorful, sweet-smelling fibers and juices. The seeds themselves would not rouse the interest of animals and men; but with their attractive packaging, they have no shortage of customers who, after consuming the external fruit, deposit the seeds in those diverse and distant places where the tree wants to plant its seeds. When we communicate with others, we employ many devices to make our message attractive. We buttress it with intellectual sophistication, steep it in emotional sauce, dress it in colorful words and images. But we should bear in mind that this is only the packaging--the fruit that contains the seed. The seed itself is essentially tasteless--the only way that we can truly impact others is by conveying our own simple faith in what we are telling them, our own simple commitment to what we are espousing. If the seed is there, our message will take root in their minds and hearts, and our own vision will be grafted into theirs. But if there is no seed, there will be no progeny to our effort, however tasty our fruit might be.